The Weddell Sea is part of the Southern Ocean and contains the Weddell Gyre. Its land boundaries are defined by the bay formed from the coasts of Coats Land and the Antarctic Peninsula. The easternmost point is Cape Norvegia at Princess Martha Coast, Queen Maud Land. To the east of Cape Norvegia is the King Haakon VII Sea. 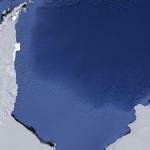 Much of the southern part of the sea, up to Elephant Island, is permanent ice, the Filchner-Ronne Ice Shelf. The sea is contained within the two overlapping Antarctic territorial claims of Argentina, (Argentine Antarctica) and Britain (British Antarctic Territory), and also resides partially within the territorial claim of Chile (Antarctic Chilean Territory). At its widest the sea is around 2,000 km across, in area it is around 2.8 million km².